There are two kinds of politician worth knowing: those of conviction, and those of savvy. The former paid tribute to the latter this week, using a word I had to look up. Jeremy Corbyn called Gerald Kaufman “an iconic and irascible figure” after the father of the House died Sunday, aged 86. Irascible – ‘easily angered’ – Corbyn chose the right word. Maybe he remembered the time in Beirut in 2011 when Gerald’s irascibility was aroused by a restaurant having run out of ice cream. With a black cloud hanging over Gerald’s head, other members of the group tried to pacify Kaufman, leader of the delegation and somebody for whom we were happy to make special dispensations. Nothing was working and the mood around the table was heavy, but Corbyn had sneaked out and returned from the Corniche with ice creams for everybody. Gerald’s irascibility was also deployed for just causes. Arriving at the Palestinian-Jordanian border in 2010, a British-Palestinian member of our delegation was detained by the Israelis. Gerald refused to proceed without our friend, offering no compromise to the Israelis, and fiercely argued his way up the chain of command until he found somebody with the power to yield to common sense. The conditions at Lebanon’s refugee camps shocked everybody on the 2011 delegation, and it was Gerald who expressed this most succinctly in this article published by Urban Dandy. 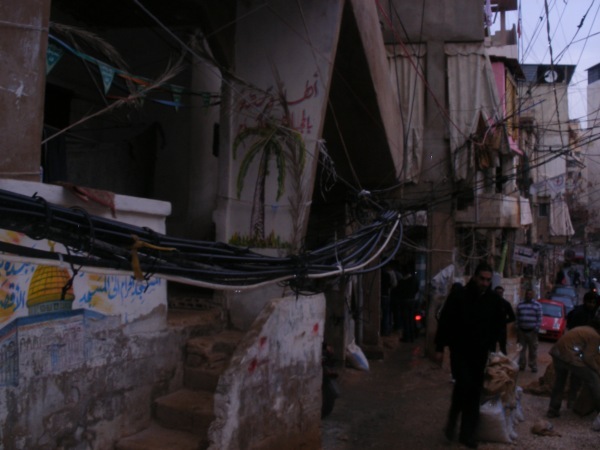 “Bourj al-Barajneh is the worst single place I have ever seen, with children haunting narrow gullies with sewage flowing down the middle; with no legitimate electricity supply, with tangled wires from bootlegged electricity hanging so low in the alleys as to constitute a near-mortal hazard. Yet 20,000 are doomed to live out their lives there, from childhood to old age, in a tiny area that has more people per square kilometre than Hong Kong or Mumbai”. Gerald saw it as a politician’s responsibility to do their utmost to reduce human suffering and degradation. He was unflinching in his intolerance of injustice and cruelty, however powerful the wrongdoer. He was aided in his pursuit of justice by a remarkable talent with words and an ability to deploy them unerringly. At a meeting with the UN in the West Bank, the room was too hot and Gerald drifted off to sleep. I nudged him repeatedly but he would drift off again, missing most of the presentation. Being the leader of the delegation, Gerald was to give feedback on behalf of the group. I exchanged nervous glances with a fellow organiser, but to our relief Gerald awakened and responded to the presentation with a series of apparently well thought out points that went to the heart of the issue, expressing his gratitude to our host and making everyone in the room question whether they had really just seen this 80-year-old man having a nap. “Do you remember one phrase used by a Labour frontbencher since 2010?” Gerald asked me before the last election, and in that question he summed up a major problem that Blair, Brown and Miliband have created; a set of MPs that lack what Gerald had in spades: gravitas. He was a great writer, with careers as a satirist, journalist, columnist, speech writer, phrase-maker and author. It was he who described Labour’s 1983 manifesto as “the longest suicide note in history”. The Israel lobby didn’t know what to do with Gerald. He made plenty of controversial statements about Jews and “Jewish money” but when faced with stinging criticism for his remarks, he was memorably nonchalant: “I can’t remember every comment I mutter under my breath”. Gerald could not be dragged into the distraction of the Israel lobby’s games, life had too much more to offer him. He wouldn’t care what they are saying about him now. He was a man of hilarious anecdotes and dry Yorkshire wit, as charming with those he liked as he was ferocious with those he considered fools. His London flat was a shrine to Hollywood musicals; he loved them “because they’re beautiful”. He also loved literature, television, fashion and people; he was a dandy, a charmer, belligerent and brilliant, I will miss him.